So, yesterday was Valentine’s Day. You know. Roses, chocolate, celebrating romance with your honey – assuming you have a honey. Sweetheart and I don’t really do much for Valentine’s Day. We talked it over early on in our relationship and agreed that being nice to each other on a regular basis was enough of a gift. Still, every so often, one or both of us has presented the other with something small on Consumer Love Day. So, I gave him a bar of raspberry pecan chipotle chocolate before running out the door for a day-long beginning beekeeping workshop. Blame library school. If it weren’t for library school, I wouldn’t have become friends with Jeff, the tech services and then head librarian at the Large Midwestern Technical College where I work. Jeff took up beekeeping before I met him. Having a honey connection was cool, but when I found out he had hives around town and was seeking new locations, I invited him to put one in our yard. 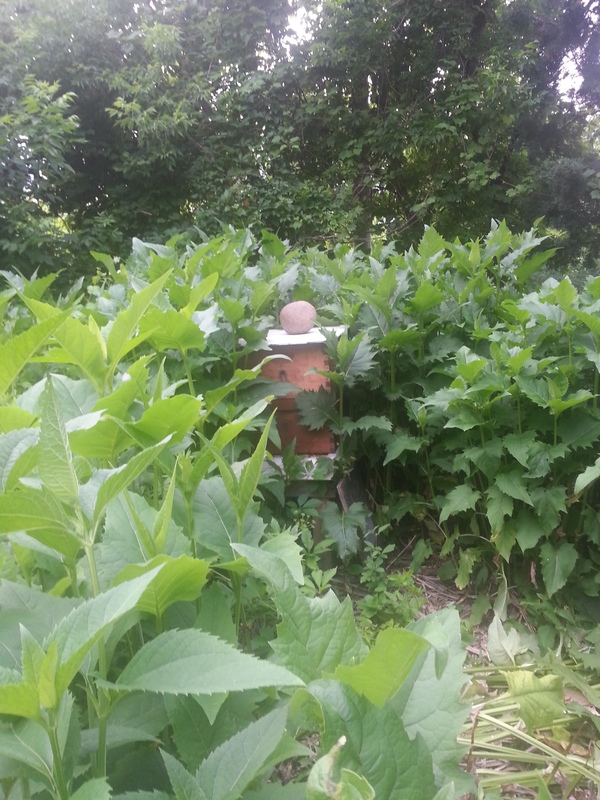 Sweetheart did a natural landscape installation back when he owned the house with Ex, and it is perfect for bees. So, nearly three springs ago, Jeff drove over and set up a hive. The beehive formerly known as Jeff’s in the backyard currently known as ours. I queried him on what to look for that would trigger me needing to call him and what I needed to do to make sure my little pollinating guests felt welcome in our yard. Jeff said pretty much nothing beyond making sure there was a water source. He did say I should call if I saw them swarming. That meant the hive was too small and they needed to relocate to roomier digs. He’d have to come out and retrieve them if that happened. He told me that they’d come out during daylight hours, that they didn’t like cold or rain, and when it was hot they would clump up in front of the beehive. “The front porch,” he called it. It was a pleasure to watch them that first summer. They’d fly in and out of the hive, and when it got hot, sure enough, just as Jeff had promised, there was a “beard” of bees just wandering around on their front porch. I didn’t get close enough to it to make the bees feel alarmed, and Jeff assured me that as long as I wasn’t wearing dark clothing or eating bananas, that probably wouldn’t happen anyway. Bees send out pheromones, and the alarm pheromone (“We’re Under Attack!”) smells like bananas. 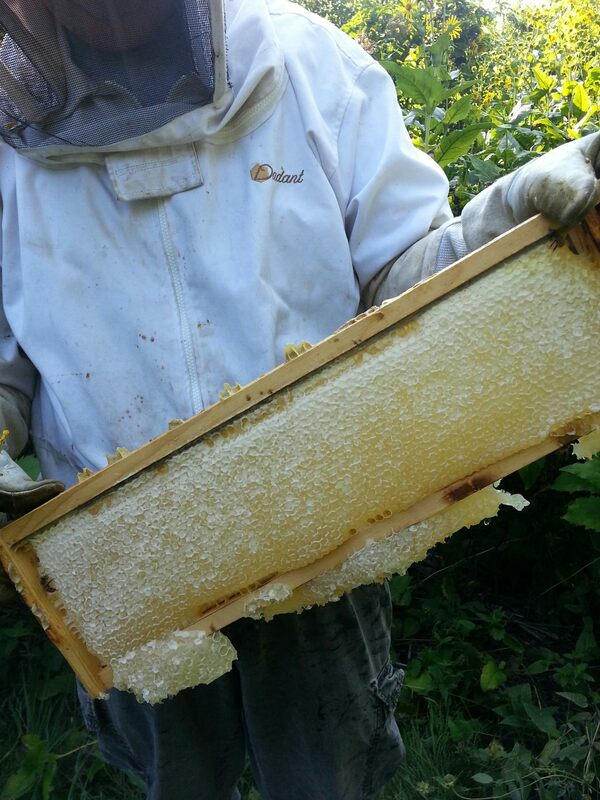 That fall, he harvested two supers worth of honey, and got the hive ready for winter. I have no idea what he did. The following spring, he discovered that the bees had swarmed in September and the few left behind hadn’t survived the winter. I learned in Saturday’s workshop that bees mostly swarm in summer. 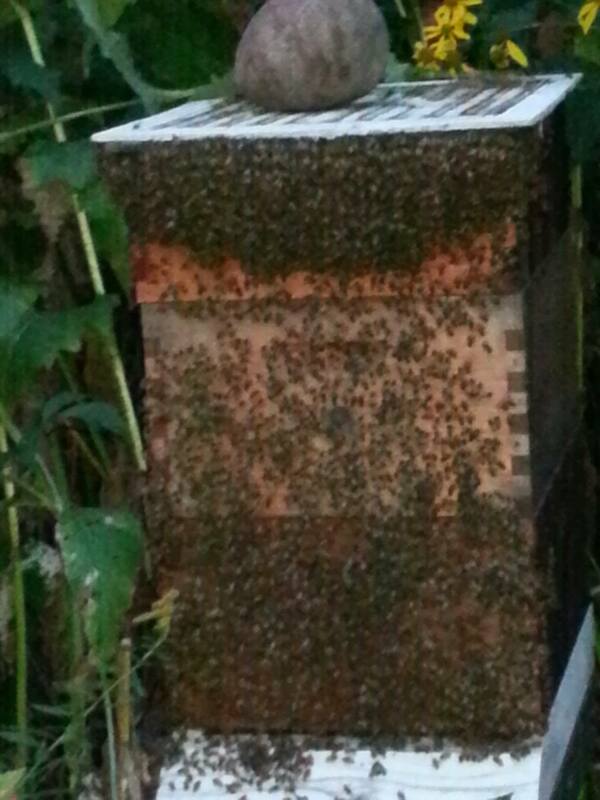 That gives the bees left in the hive a chance to populate the hive and make it big and strong before winter. A late swarm would pretty much mean the bees left behind were doomed, and that’s what happened to the colony in my backyard. “Bad beekeeper,” Jeff told me as he installed a new colony in the hive last summer. Those little guys got busy immediately, populating and pollinating and hanging out on the porch. Jeff, holding a honey frame from the colony in my back yard. Then, in September, Jeff got a new job. In Colorado. I was crushed, not just because my friend and hopefully-some-day-colleague was leaving, but because he was going to take my little buzzing entertainment complex along. “I’ll leave it for you,” he said. So, here I am, with what I can now tell you, thanks to Andy Hemken, is a Langstroth Hive. Andy spent approximately seven consecutive hours filling the heads of 55 novice wannabee-beekeepers with all kinds of information, all of it interesting and the rest useful. Interesting was the fact that in 1981, there were 5 million beehives in the US, and now there are 2.6 million. The largest honey producer in the country is North Dakota, followed by South Dakota, Montana and Minnesota. Interesting also is that we produce 1/3 of the honey we consume. The rest is imported, a lot of it from China. As far as beekeeping itself goes, there are approximately 95,000 hobbyist beekeepers (1-50 hives), 5,000 for whom beekeeping is a sideline (50-300 hives), 1,000 commercial beekeeping operations (300-5,000 hives) and 100-15,000 bee breeding hives, which make new queens and honeybees. There was honeybee biology, diseases, behavior, types, food and nutrition. We learned about hive materials, bee space, why bees die, beekeeping equipment and a year in the life of a beekeeper. There were beekeeping variables, suggestions for hive placement, harvesting and extracting honey, and, of course, the truth about stings (they’re inevitable). We also went home with a book and invitations to an equipment workshop in March and a field day in June. Novices and experienced beekeepers will pair up and work hives together. Before that, though, I will have to get myself a veil, some gloves, a light jacket and boots and see whether the bees Jeff left me survived the winter. Yesterday I learned that you don’t want to open up a hive unless it’s above 45F (7 for you Celsius types). This morning, the temperature here was 3F (-16). I have no idea whether I’ve got live bees at this point. But I know for sure I don’t want beescicles.